Red warning lights started flashing, accompanied by a klaxon echoing loudly in my head. I was perfectly OK with 99 percent of what was written. It was standard industry boilerplate vaguely specifying the general scope of the work envisioned and how much I would be paid per hour. However, there was one clause that was more than a little bit out of the ordinary. The agreement said that I could not work for any of the company’s competitors for a term of two years after our agreement ended. No list was proffered as to whom these actual or imagined competitors might be, leaving open the real possibility that working with almost anyone else in biopharma would put me on the wrong side of the agreement. I had three big concerns. The first, as outlined above, was the fact that the competitors were completely undefined. This left me in the dark as to exactly which potential clients I might need to turn down going forward to honor the agreement. The second problem was that there was no clear language defining just how much work they were engaging me to do. The job might entail hundreds of billable hours, or it may be limited to a very few. Finally, the date on which the work would be deemed to have started was also undefined. Would the clock start as soon as I signed the agreement, or would it begin only after I completed the rather poorly defined work product? I told the attorney who sent me the document that I couldn’t sign the agreement as written. I know that big companies hold all the power in negotiations with individual consultants like me, but this legal document was completely one-sided. I wasn’t going to agree to not work for (essentially) everyone else in the industry for two years in exchange for what might be only one (and maybe even zero) billable hours of work. The client was also not interested in limiting the non-compete language to the exact nature of the project being proposed. The thought crossed my mind that maybe the company really wasn’t interested in retaining my services at all. Maybe they simply wanted to prevent me from working for another company that they anticipated might be in an adversarial position in court. Biopharma companies often buy up intellectual property that they have no intention of using simply to keep their competitors from getting their hands on it. Why not take a similar approach with technical consultants and expert witnesses? Was there a way to move forward? I thought of changes that would enable me to sign the agreement. My offer to accept the restrictions providing the agreement was limited to one particular molecule/product was rejected. I also offered to adhere to the terms of their proposal as written if they would guarantee me a certain minimum number of hours of work each year (making the document, essentially, a retainer agreement). This was a company that earns billions of dollars in revenue every year, and my request was extremely modest. Outside counsel said that they would take it up with the client, but that was over six months ago, and I’ve not heard a word back one way or the other. I’ve never had to sign a non-compete agreement during my career. It’s been long debated as to whether or not these arrangements are even enforceable. Often it depends on specific state laws, which vary widely across the nation. Idaho recently put in place much stricter laws that put a significant burden on “key employees” to prove that they wouldn’t be harming their previous employers when they move to a new job. 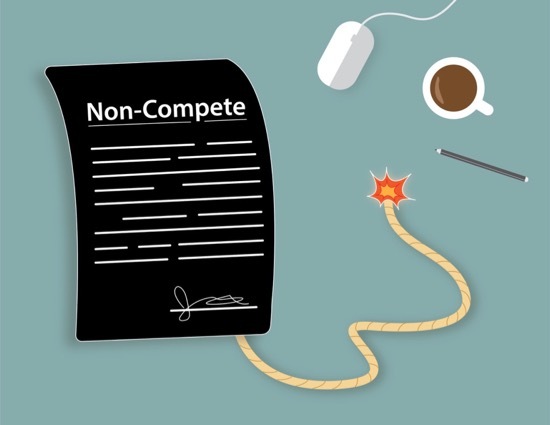 At the other end of the spectrum, non-compete agreements are generally unenforceable in California, and employees have won damages (for both wrongful termination and unfair trade practices) when companies tried to impose these agreements. As a practical matter, no sane person wants to get into a legal dispute with a multi-billion dollar corporation (or, as the U.S. presidential campaign illustrated, a bilious billionaire businessman). One may ultimately win a Pyrrhic victory in court, but these legal procedures never favor the little guy. As philosopher Lysander Spooner put it, “It is a natural impossibility for any man to make a binding contract, by which he shall surrender to others a single one of what are commonly called his 'natural, inherent, inalienable rights. '” Maybe the right to not restrict the work of others belongs on this list as well? When all was said and done, I didn’t need to know the intent behind this non-compete agreement. I just knew that I couldn’t sign it, and I can’t imagine who would. So why do companies ask their employees to sign non-compete agreements? In the past, this process was usually limited to company leaders and technical personnel who had deep knowledge of confidential information. They know how their organizations operate and what gives them advantages over their competitors. Most of these folks are college graduates, and many of them have advanced degrees in law, business, or science. The desire to keep these key employees from leaving one firm and essentially replicating their work with a rival organization led to the development of these agreements. The scope of people being asked to sign these agreements has greatly expanded in recent years. They’ve been coopted to cover even the lowest paid employees in an organization, including unskilled laborers. For example, at some janitorial firms and fast food establishments, the workers are being asked to sign agreements that restrict them from working for competing firms within a certain geographical radius, such as three miles. The employing companies use these agreements to hold down wage growth because employees can’t take jobs at better paying firms without having to drive cost-prohibitive distances for the new job. Are non-compete agreements even legal? They’re covered by state, not federal laws, and in many states (including California, North Dakota, and Oklahoma) they are considered unenforceable. However, the fact that they can’t be legally used doesn’t stop companies in those states from asking their employees to sign them anyway. The same percentage (nineteen) of workers in California and Florida have been asked to sign non-compete agreements, even though they are enforceable only in Florida. Not everyone can afford to hire an attorney if they are sued for violating a non-compete, even if they stand on solid legal ground. And many employees will not check to see if the agreements are even legal, operating under the misimpression that they wouldn’t asked to sign something if it wasn’t within the law. Bottom line: think long and hard before signing one of these agreements. Read it carefully and find out if they’re even enforceable in your state. Your work is valuable, no matter what position you occupy in a company (or if you’re just a consultant like me). Don’t surrender your rights without understanding what the long-term consequences might be for your career.